A majestic General Sudirman statue is coloring capital city of Jakarta. The statue measuring 12 meters and the 6.5-meter of high and voetstuk about 5.5 meters, located in the Upper Hamlet, before the House of BNI, in the middle of the road which divides adjacent to Jalan Sudirman and Jalan Thamrin. This bronze statue weighing 4 tons with a budget of Rp 3.5 billion and was undertaken by the artist and art lecturer Institute of Technology Bandung, Sunario. The figure of General Sudirman depicted saluting a sturdy stand up and head slightly upwards to give a dynamic impression. Because standing in the middle of the area filled with diverse activities, the statue was designed intentionally simple and does not require a lot of details. Sudirman statue of development plans and a number of sculptures that will adorn the main streets named after streets sticking in September 2001. The plan is the realization of a statue of the hero contest conducted in 1999. Location of the statue is a straight line that led from the Statue of the Youth Building in Kebayoran until National Monument obelisk. The cost of building the statue which cost around Rp 6.6 billion came from employers, not from APBD DKI. As compensation businessman gets two points billboards in strategic locations, Upper Hamlet. While that determines the funding handed over to family Sudirman. Employers who have been designated to fund construction of the statue is PT. Patriamega. As compensation, PT. Patriamega earn two points billboard in a strategic area in Upper Hamlet, namely at point A and 6B. For the organizers of the billboard, that point is very strategic and most expensive resale value. According to the plan of the statue of General Sudirman was due to be inaugurated June 22, 2003 to coincide Jakarta Anniversary 476, but not realized. Inauguration finally held on August 16, 2003. The inauguration was marred rallies a group of youths. Commander of Independence should be the symbol of the spirit of struggle of the Indonesian nation has now faded meaning of heroism. 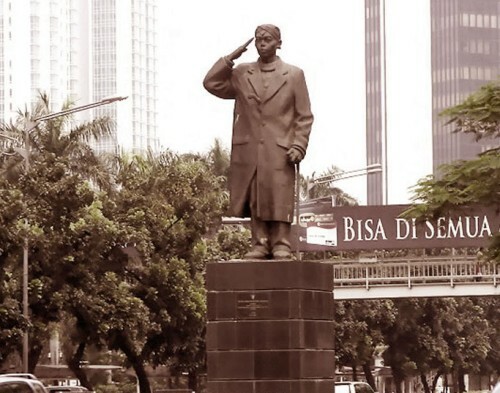 Because of General Sudirman is depicted in salute position. The position of the statue is considered out of place because as the Commander in Chief, Sudirman not properly deferential to any citizen who crossed the road, which was supposed to honor. This also was raised in the film Nagabonar 2. Yet the Governor of DKI Jakarta DKI accompanied by the Head of the Parks Department and one of the great family of General Sudirman, Hanung Faini, it inaugurated the founding of the Statue of General Sudirman. General Sudirman was the leader of guerrilla forces during the independence war (1945-1949). He bears the gift of the Great Commander. Service and dedication to the nation and the country deserve to be remembered and memorialized.